Be prepared for the upcoming movie, The gil with the dlagon tattoo. Last time I went to rememberance day to show my respect and appreciation, I was bashed. Is that some kind of generation gap? Hand me the White Out…. Only over his dead body. To sleep—perchance to dream. Ay, there’s the lub! We all know that ”Let’s in Peace” would be correct Engrish. (Although it’s still a mystery why ”Rest in piss” remains more widely accepted form). I’m sorry but, what does it say exactly? All it takes is a momentary slip of a needle, and – voilà! An even bigger tattoo to cover this one up. While Kris Gould may actually be right here, that nice quote is not what will come to mind first for most viewers of this tattoo. 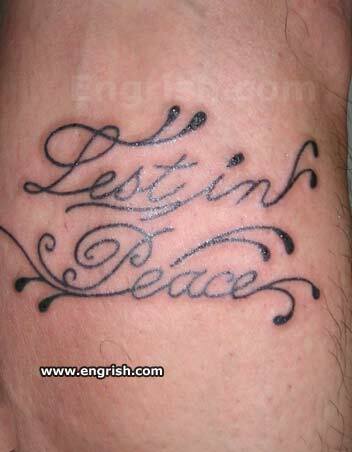 Wait- Why would someone get “Rest in peace” tattooed on them in the first place? And even if it was supposed to say “Lest”, it still doesn’t make sense..
^^^ Perhaps it’s their “final” tattoo? Darth: … Actually, I made that up. Lest is more… tattoos to cover up this one that is. And may God bless your loul. OK OK! this is enough. Sara is having fun at my expense. there were a series of pictures taken. The final tattoo reads: Lest in Peace Madame Bullerrfry. I’d rather lust in peace. Lest in Peace We Die, Be Viorent!